The Sandy Creek High chapter displays their fifth consecutive SkillsUSA Georgia Gold Chapter of Distinction award, and is under consideration as one of 24 National Models of Excellence. Photo/Submitted. A total of five students from Sandy Creek High took first place honors in their events at the SkillsUSA Georgia State Leadership and Skills Conference and have qualified to compete at the national level. Liberty Harris, Gianna Phan and Kayla Brooks earned gold in Promotional Bulletin Board; Hannah Ohlmeier earned gold in Advertising Design; and Branden Goins earned gold in T-Shirt Design and will compete at the SkillsUSA National Leadership and Skills Conference in Louisville, Kentucky in June. The Sandy Creek High SkillsUSA chapter is under consideration as a SkillsUSA National Model of Excellence for the fifth time. The announcement will be made at the national conference, only 24 chapters across the nation will receive the designation, which is the highest honor a chapter can receive. Sandy Creek was Named a National Model of Excellence in 2015, 2016 and 2018. 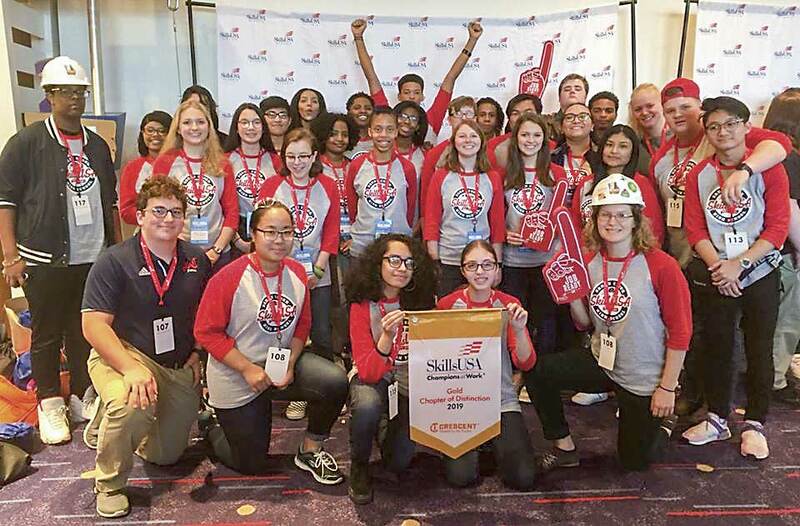 The school is up for consideration after being recognized as a Georgia SkillsUSA Gold Chapters of Distinction for a fifth consecutive year. Sandy Creek High – Daniella Alvarado, silver, Job Skill Demonstration Open; Liberty Harris, silver, Georgia T-Shirt; Nyah Huguley, silver, Georgia PowerPoint; Sarah Sorme, silver, Math Applications; Hannah Ohlmeier, bronze, Georgia Brand Design; and Abby Paver, bronze, Technical Computer Application. SkillsUSA is a national nonprofit partnership of students, teachers and industry working together to ensure America has a skilled workforce. SkillsUSA helps high school and college students enrolled in career and technical education programs to excel by teaching employability skills such as communication, problem solving, and leadership in conjunction with their trade, technical and service occupation skills.